Platelet Rich Plasma has been used in the medical world mostly when a repairing process was necessary: i.e. healing wounds; to speed up recovery after surgeries etc. PRP is rich in growth factors and promotes localized cell growth. Over the last few years, some studies have also suggested that PRP may promote hair growth. Platelet Rich Plasma has been proved to increase derma papilla cell proliferation, which in turn show an increase in regulation of potent hair growth stimulators. 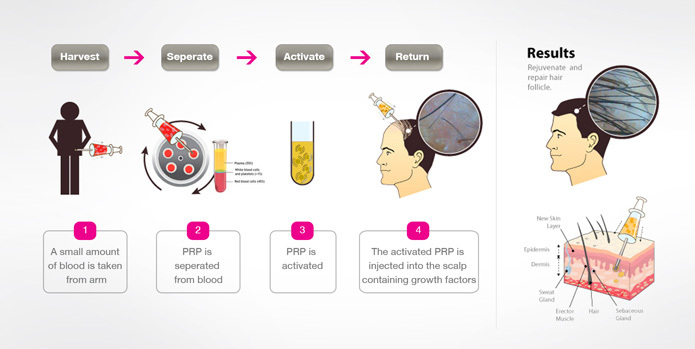 PRP consists of using patient’s own blood to extract platelet derived growth factors and inject them into the scalp to regrow miniaturized follicles and to increase hair density. Apart from this therapy being used for most common hair thinning and hair loss issues, the Platelet Rich Plasma represents a very promising, as well as a safe option for the management of Alopecia Areata. PRP has been shown to produce thicker transplanted hair growth hence it is a widely used treatment in aid of a hair transplant procedure. This therapy has no barriers and is effectively used to treat men and women suffering from hair loss.